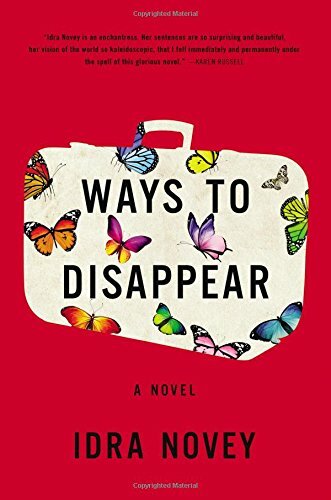 Ways to Disappear opens with the story of an eccentric Brazilian writer—Beatriz Yagoda—who disappears up a tree while enjoying a good cigar. At first, it appears she might be trying to outrun a sagging career and writer’s block but we are soon to learn she’s also running from gangsters trying to collect on the massive debt Yagoda has run up thanks to a very bad online gambling habit. Yagoda’s disappearing act reaches the ears of her biggest fan, Emma Neufeld, an American academic from Pittsburgh, who has found in Beatriz’ fantastical books everything that is missing in her own life. Emma’s life’s work is to translate every word Beatriz writes and, when Emma hears the author is missing, she jumps on a plane to find her. In doing so, Emma disappears from her own personal life, which she finds wildly unsatisfactory. She has a boyfriend who wants to marry and settle down, but Emma is consumed by doubt. Beatriz’s disappearance, then, comes at the perfect time. All questions of marriage are left behind when Emma heads to Brazil. Once there, Emma gets entangled with Beatriz’s children, Raquel and Marcus. All three of them are threatened by a ruthless gang leader who wants the money Beatriz owes or else—and it turns out the “or else” is not an idle threat. Also being harassed by the gangsters is Beatriz’s publisher who is desperate to get one last book out of his prized author. It’s a plot filled with twists and surprises, and Idra Novey makes it come alive with prose that is both magical and lyrical. Novey is also a published poet and it shows. Her unique style is often breathtaking, such as the scene when Emma finally gives in to her own raw nature and opens to door to allow the handsome Marcus into her hotel room. “She unlatched the lock. The harsh fluorescent lighting of hotel hallways usually robbed a face of its beauty, but not Marcus’s. Not his high cheekbones or his radioactive-green eyes. Emma pulled the door shut and he ran his hands over the goose bumps on her arms, over her breasts and down her ribs. . . .
“She’d spent her life desperate to measure exactly how much she knew, and what had it gotten her? “An adjunct teaching job that came with a rusted metal desk she had to share with two other adjuncts, one of whom lived on Doritos and left neon-orange fingerprints on her Post-its. “A boyfriend who spent his evenings charting how his pulse rose during his morning run. Novey has a style all her own and manages to hold the reader through her prose. She is a singular voice who impressively has spun a story into a thrilling ride for her characters and readers alike.